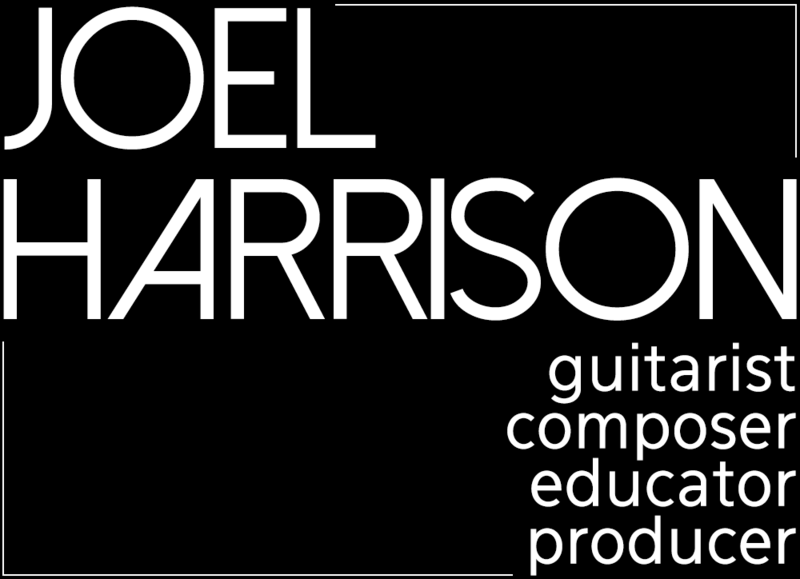 Joel Harrison is available for private lessons in person or via Skype in complete musicianship including: composition, arranging, ear-training, guitar, forging a personal style, and more. If there is a demand, group lessons are available as well. Please contact Joel directly about rates and scheduling. “Just a brief note to thank you for making the time available in your touring schedule to address the students in my jazz improvisation class. The clinic you presented was exactly the type of workshop material not likely to be address in a typical classroom lecture. I particularly admired how your philosophy encompassed the roots of personal expression – i.e. a strong musical vocabulary forged by hard work in the practice room, the compositional impulse to embrace broad musical styles (pop, funk, folk, world etc), and a penchant for collective improvisation forged on the gig where new music emerges and collaborative bonds solidify between artists. Your ability to merge optimism with realism was enlightening and so very helpful. The following are 1-2 hour long clinic sessions available for high schools and colleges/universities. If you have a specific need or request for a particular topic, please inquire at joel@joelharrison.com. Harrison begins by examining what makes a good solo and a good melody. He discusses shape, contour, theme and variation, expansion and diminution, and narrative focus. He illustrates the concepts with great solos by Lester Young and Coltrane, as well as with pieces by Beethoven, Stravinsky, etc. Students learn to be judicious with materials, eking every last possibility out of one idea. Harrison encourages more advanced jazz musicians to expand their borders by absorbing key lessons from classical music. Some examples are: Messiaen’s seven modes, Bartok’s bi-tonal scales, odd time signatures, forms that are rare in jazz composition (binary, ternary, rondo, variations, etc. ), and counterpoint. The class will also learn tips on becoming better ensemble players. The goal is to help students broaden their basic jazz skill set. They will walk away with hands-on tools to increase productivity and creativity. Harrison begins by addressing the question, “Why should a classical musician learn to improvise?” The answer is that it will make him or her a more interesting and employable player and person. Also, it is fun! He discusses “letting go” and accessing a more primal, child-like wonder, pointing out that improvising has historically had an important role in classical music. The class takes the simplest of building blocks, a one bar rhythm or phrase, and explores various ways to extrapolate upon it. New levels of difficulty are introduced, Harrison employs games, methods used in theater, and body movement to develop core principles. There are corollaries between jazz improvisers and classical music composition. How do the Diabelli Variations relate to Blue Trane? Harrison also speaks about necessary skills for integrating with jazz or rock musicians. More and more composers of jazz and progressive rock utilize classical instruments (strings esp.) What are the pitfalls? What tools are required? How can classical composition be enriched by jazz or music from other countries? This session is devoted to maximizing the musician’s productivity, both as a player and commercial entity. Harrison will guide students in the best use of practice time, expunging what is extraneous from the daily routine, increasing focus and preventing injury. Students will hear firsthand the highs and lows of booking, touring, generating income, and leading a band. They will learn specifics of what one needs to survive as a working musician, whether from home, or traveling the world. Music is one of the few activities that link us all. What are aspects of music that enrich us across ethnicity, background, and stylistic bias? The class will address practical ways to build bridges between multiple traditions. For instance, the jazz player can expand his improvisational palette by incorporating ideas from the rhythms and ragas of Indian music. Harrison can teach basics of African rhythm, both 12/8 and 4/4, to ground students in grooves that are the predecessors of jazz, R&B, and rock. Expanding borders is an inevitable behavior amongst open-minded artists. The class will address developing a strong personal identity in the pluralistic world we live in. How do you find out who you are, given so many possibilities? How is unity found? Harrison recently released his first jazz big band cd, the product of three year’s work. This class explores the many ways that composers have expanded the harmonic, rhythmic, and orchestral palette for big bands in the past 15 years. Examples will be taken from Harrison’s own writing as well as other prominent composers, demonstrating the ways in which classical, rock, and world music freely intertwine with the jazz tradition. Practical as well as conceptual points will be elucidated for the player and composer alike. This class can be structured with Harrison as guest artist with a school band or as a stand-alone lecture.